1. Roller skating makes me feel crazy alive. I can roll and roll and roll around a circle (oval?) with my limited skill in the midst of some of my favorite people and a man flourishing a white towel with every epic twirl, and never tire. I cannot explain why repetitious circles on the rink amidst the age old smells of stinky socks and leather skates move me like they do, but some things are not meant to question. 2. Each pair of my jeans wear out in the same place, and I can tell you, as Sici told me, it’s not a place people would pay to have intentionally “distressed.” Why can’t I get some appropriate knee wear? I’d be willing to wear them for years after that, but this locale, in the lap, shall we say? Not so much. 3. Have you discovered Australian hand pies, known as pasties? Oh my. Life may never be the same. And in the interests of passing on my newfound knowledge, it’s pronounced “pah-steez” (emphasis on the “pah”) and not “pay-steez.” An important distinction. 4. When your family says prayers of thanks for the things they love about you on your birthday night, and your five-year-old says, “Thank you that Mommy is such a silly mommy” when you know how decidedly serious and “unsilly” you can be sometimes, well — that might be one of your most favorite mama moments ever. 5. If the forecast shows one sunny day on spring break, followed by eight days of rain, grab the sunny day by the horns. Take the people on a slightly too long bike ride, grab one of the 31 flavors and eat dinner outside. You won’t regret it when the inches and inches of rain come. 6. And when you ride your bike, pulling your five-year-old with your eight-year-old and twelve-year-old trailing behind, and you pass through cherry blossoms that fall like snow, and your children happen to be singing, “Mercy is falling on me” — yeah, there aren’t really words for that one. 7. The regular bounds of time don’t apply on date night. Un-hemmed by the potty breaks and hurting feet and accidental happenings of children, four hours can stretch far — across city blocks and live music and into happy hour and onto a plate of really rich dessert. And you’ll feel so full. 8. Secondhand and vintage stores are the best place to look for men’s dress shoes. Classic and well-made and way less expensive. ($32 — holla!) Just sayin’. 9. “What can I do for you?” is one of the most powerful questions we can ask and a wise way to keep our savior complexes and their heavy, marring footprints in check. 10. When you visit a shelter for women and children where your family will begin hosting a monthly meal, and you witness a glimmer of the pain and courage and dignity of human life, and you relate to the fierce broken love of a mama for her children, you’ll want to pull over on the side of the freeway and cry a while afterwards. 11. There’s almost nothing in the world I’d rather bear witness to than someone realizing a piece of a dream. That and butterflies. So watching the monarchs with 3-D glasses, with my little people grabbing for the winged creatures, I couldn’t help but reach for them myself. 12. All of creation points back to God. The rainbow spanning our neighborhood, the antennae and little hairs that direct the monarchs right down the Rio Grande and to Mexico, the morning calls of birds, the massive white clouds across a peeking blue sky. Glory. 13. We’re continually capable of growth, so when a given person receives a “rejection” that in the past would have broken her and caused her to question everything she hoped about herself, and instead she exhales and believes in hope and goodness and gives thanks and knows she’s loved and held, that is just something else. Each month Emily Freeman at Chatting at the Sky invites people to share things they’ve learned over the last month. Some are funny (hers this month were hilarious) and some poignant. I’ve been wanting to do this for months, but have learned that I do not usually remember things well unless I write them down. What’s one thing you’ve learned this month? I’d love to hear! Your list is great. Number four made me smile :). Glad to come by and see your words via Emily’s link-up. Thanks so much for stopping by, Julie. Yeah, #4 made me smile, too. For sure. That was beautiful Ashley. I learned a lot of things this month, too. One of the things I learned how to do this month, was how to reply to your blog using my iPhone! Yay!! Woot woot! Thanks for being here, Uncle Don. It always means so much to me! Thanks, Aprille! I had so much fun with it. 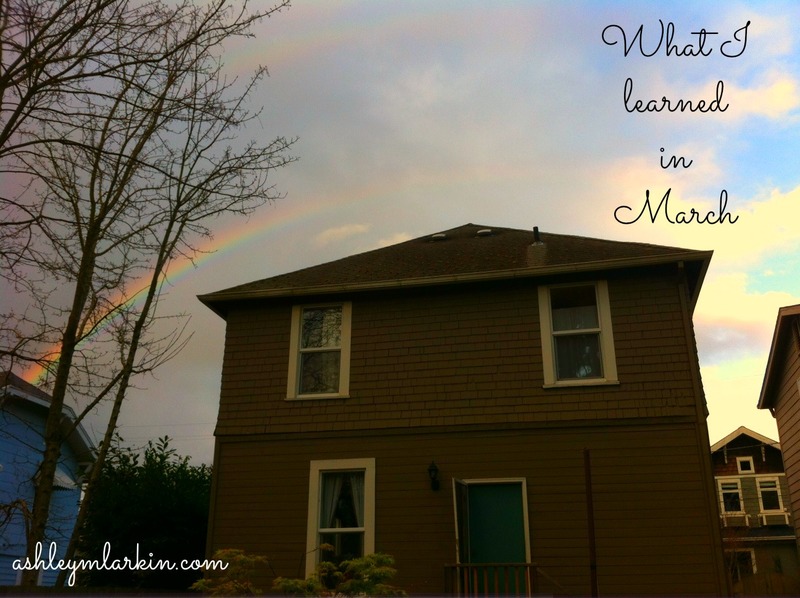 Maybe you want to join in for the What I Learned in April link-up? I’d love to read yours! I’ve thought about it! I just never get around to writing it! I learned that it is wonderful to hold my 4.5 year old son’s hand, but it is entirely even more wonderful when he reaches up, grasps hold of my hand, and says, lets hold hands so we are sure not to lose each other. Oh, Krista, what a heart melter. I love how they wear their little hearts right on the outside. Thank you for the gift of your presence here. Ashley! This is just beautiful. The humor, the tears, the challenging, the captivating moments- all of it- so lovely! I am so thankful to be getting to know you. You are a delight!!! Aww, thanks, Becky. You are such a dear encouragement to me, and I appreciate the ways you accept the various parts of my writing voice. You are a blessing! Elizabeth, my local sister, yes — the pah-steez! There’s a wonderful place called Pacific Pie Company (1520 SE 7th, with a new location in NW). They’ve got not only the savory meal type pies, but also delicious dessert pies! So worth the trip. Maybe we could meet there for our date? It sounds like you had a good month. I liked your family’s tradition of saying thanks for a person on their birthday. #13 is so true. I like that tradition, too, TJ. I’m always surprised by what comes out in those giving of thanks. And I’m so glad you know the truth of #13. It’s a literal life changer. Bless you. This is soo fun Ashley! I learn every day, but of course never think to record them…like the quirks of driving my sis-in-law’s vehicle over Spring Break, thinking the battery was dead & getting help to jump it, when in reality the clutch wasn’t in (lol – only me)! Haha! Oh my gosh, I love that, Becca. That’s a memory maker right there. Thank you, Mama. I’ll meet you somehow on May 1st! Can’t wait to hear what you’ve learned. It’s SUCH a fun exercise!